This is the third and final installment of Edible Monstrosity. If you haven’t read Part I or Part II yet, check them out first. So, I decide to go ahead and assemble the cakes because, even though they weren’t pretty, they were still edible. At this point, I realized that I don’t own a cake platter. The only thing I can find to put the cake on is an old bar tray with deep, two-inch sides. When I put the first cake on the tray, the sides came right up to the large overhanging muffin top of the cake. Which I see hasn’t set up at all and is really just chocolate pudding. No matter how much pudding I pile on. After I frost the bottom layer, I placed the top layer on and started frosting that. But it keeps sliding around on the pudding layer. I can’t get it to hold still, so I search around the kitchen and find some cocktail umbrellas left over from a previous party. I pull the paper off and use the sticks as long toothpicks to hold the top layer to the bottom. I start frosting the top layer, but by now pudding is just dripping off the sides of cakes that are being held together with deconstructed cocktail umbrellas. It looks horrible, yet still manages to taste decent. I wrap the entire monstrosity in foil and head out the party, where, once we cut into it, discovered that it was super dense, like pound cake but heavier. A 5-pound cake. Despite the bumps along the way, my first made-from-scratch cake was a success! 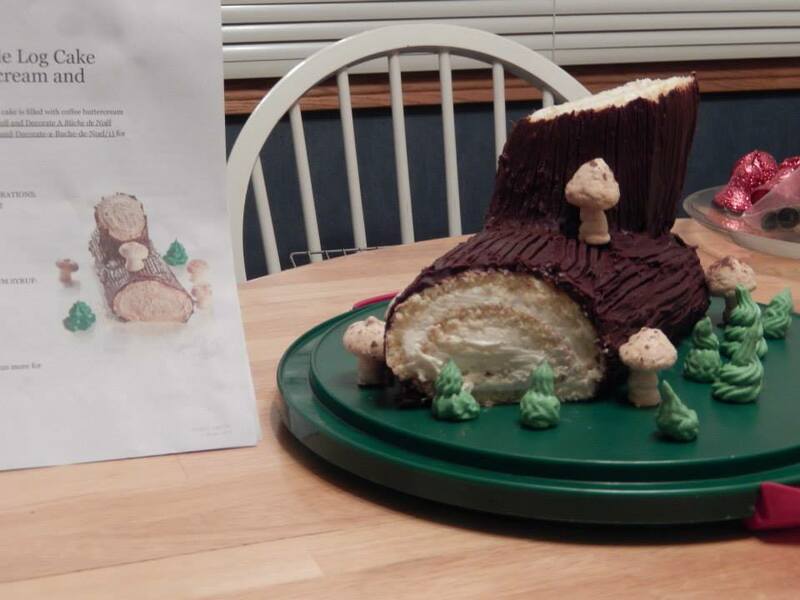 So, that’s the story of the edible monstrosity. What lessons can we take away from this tale? Never give up! Had I kicked in the project at the first sign of trouble (the exploded cakes in the oven), there would have been no end product. Sure, it wasn’t perfect, but it served its purpose and made for a great story. When you’re just starting out, and are building experience, be open to creative solutions. I didn’t have a cake platter, so I used a bar tray. My frosting was too thin, so I stripped cocktail umbrellas and made long toothpicks to hold it in place. Again, it wasn’t perfect but it worked. Be open to feedback. I had told this story a dozen times, but it wasn’t until six months later that someone gave me some useful feedback that I incorporate to this day (to cut the tops of the cake off to make a smooth surface. Doing this had never occurred to me before that moment). Even the stealthiest ninja, the best baker, the highest-converting marketer, starts as a novice. Don’t let early frustrations or disappointments stop you. Practice long enough and you will get better. I kept practicing and eventually created a Bûche de Noël, a traditional French yule log cake that I made from scratch. Where you start is not always where you’ll end, if you keep practicing. Discover the 5 C’s of Indoctrination and start converting your curious prospects today! This is the second installment of Edible Monstrosity. If you haven’t read Part I: How Old Do You Have To Be To Acquire Common Knowledge? Check it out here first. While I waited for the cake to bake I turned my attention to making chocolate frosting. 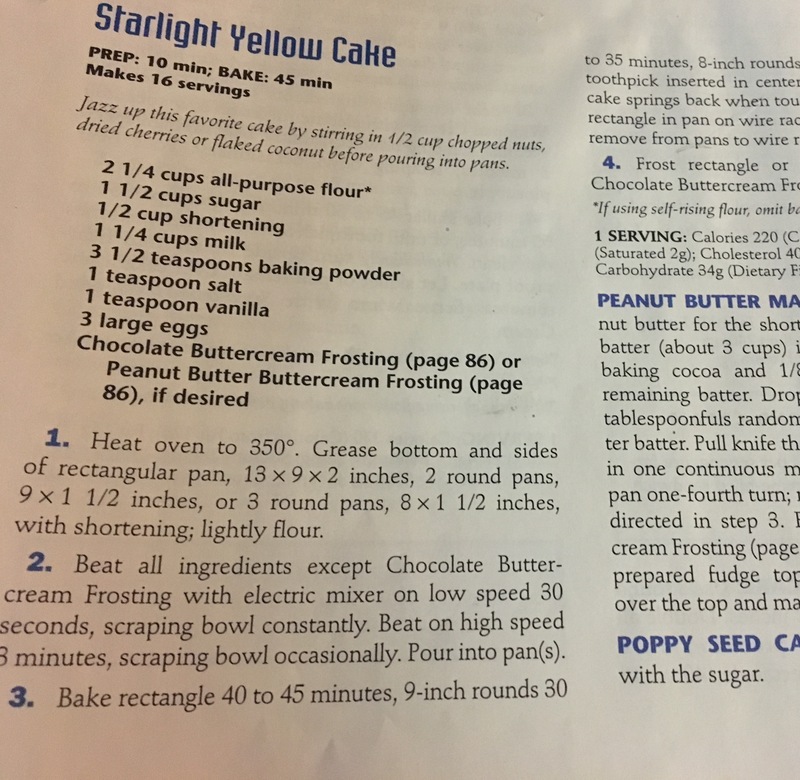 Even though Betty Crocker offered a recipe for companion frosting in the yellow cake recipe, I had something else in mind. I don’t know why, but I did. I had heard of a tasty cake frosting made from chocolate pudding. So I decided I could that. Even though I’d never done anything like it before. Maybe flour… I honestly can’t recall at this point. But I do remember expecting it to firm up and become frosting while it sat in the fridge for an hour. “Uh oh,” I remember thinking, clearly understanding that something was wrong, but not wanting to face it. Just ignore it. It’s like Shrodinger’s cat. 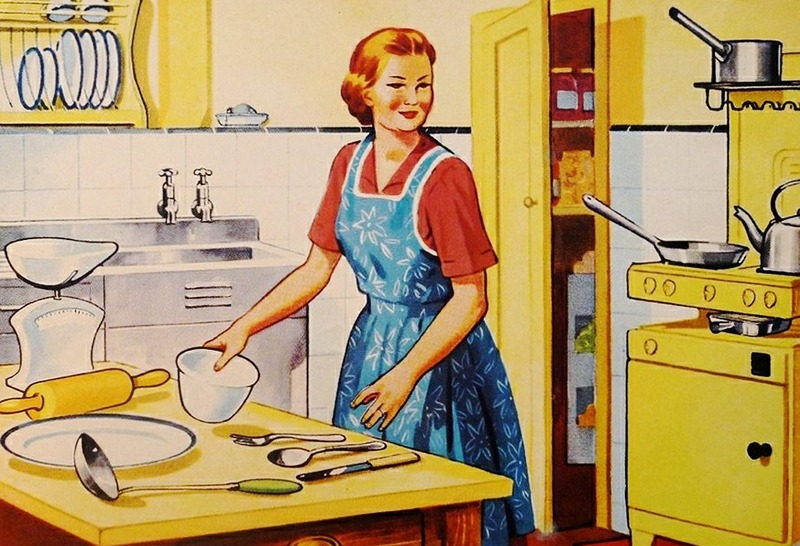 As long as I don’t look in the oven, the cake is doing just fine. There’s no smoke filling the apartment, but the subtle burning smell doesn’t let up. The sight that greets me is one I had never seen before, or since. In both cake pans, the batter had risen. But with nowhere to go, it mushroomed up over the edges. The pan on the right was drip, drip, dripping batter onto the bottom of the oven, thereby baking another, smaller cake on the oven floor. This is where that burning smell was coming from. Horrified, I slammed the oven door, turned the oven off, ran into the living and flung myself onto the couch. “I fucked it up! I fucked it up!” I kept repeating, devastated. I had so wanted it to be perfect for my friend’s birthday. After a few minutes of self-pity, I decided maybe it could be saved. I turned the oven back on and decided to wait out the timer and see what happened. When the timer went off, I pulled two enormous muffin-looking things out of the oven and set them on the stove to cool. I poked at them. They seemed to be cooked. Aside from their horrible appearance, it tasted fine when I swiped a nibble. What’s the moral of Part II of this story? You may not know you’ve messed up until the results roll in. But don’t give up at the first sign of trouble! If you’re not getting the results you want with your indoctrination strategy, hang in there. If you have all the correct ingredients (see the 5 C’s of Indoctrination), but biffed the execution, you can usually make adjustments to get better results. Oh, and it doesn’t do you any favors to ignore problems in your marketing. If you sense something is amiss, address it head-on. I don’t know about you, but I love hot wings. I love the endless variety of sauces, flavor combinations and heat levels. 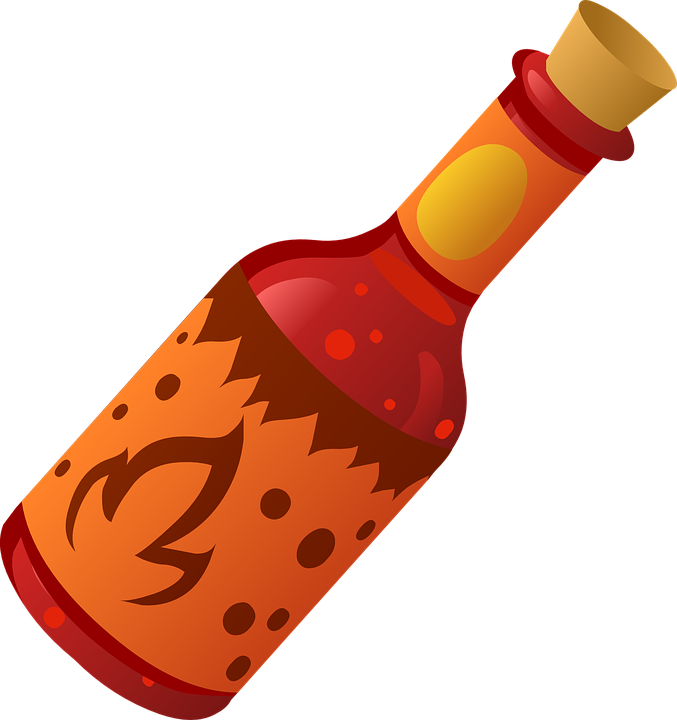 Too many hot sauces focus on the pain, without providing any real flavor…. I figured he was being overly dramatic and dug in. I took one bite and there was no flavor… only pain. Instant, searing pain. I guzzled my pint of beer and immediately ordered another. I pushed myself to eat two of these monstrosities, and that was more than enough. I left the rest. Never again, I swore, would I get burned like that. There’s a place just outside Madison, Wisconsin called Quaker Steak and Lube. It’s got a kind of race car theme and specializes in hot wings. Back in 2006 or so, to order their hottest hot wing sauce you have to sign a medical release form. I wasn’t quite that brave, so I ordered the wings in the hot sauce just below that level. Starting with the second hot wing I realized the heat was building. By the third wing, my scalp was sweating and it was hot hot hot! And I ate the whole basket. They were that good. Now, what’s the difference between these two approaches? But one put flavor first, heat second. The other brought only heat and pain without a shred of flavor. Remember this in your indoctrination marketing. Flavor is all the good stuff that creates the feeling of goodwill toward you and your business (content, email follow-up, nurturing, answering questions, providing solutions, etc.). It’s the special sauce that builds trust and encouraged prospects to get to know, like, and trust you. Think of the heat as your pitch, the offer. They don’t know what to expect and are proceeding with caution. If you come out blazing with your offer and omit all the content and indoctrination, you’ll drive your prospects away, never to return. In short, you’ll burn them out. But if you offer flavor and an enjoyable experience, they’ll welcome the spice that burns just under the tasty surface. Apply this slow-burning, tasty metaphor to your indoctrination and marketing strategy and you’ll build loyal customers and a solid tribe. Get your spice on with this handy 5 C’s of Indoctrination Checklist. In my previous post I talked about content marketing and how it creates the cornerstone of your prospect indoctrination strategy. Content marketing is one side of the coin, but on the other side lives something very important that is NOT to be omitted from a successful strategy. And that’s a call to action (CTA). Content is important for drawing cold prospects to the warm light of your solutions, but if there’s no call to action when they get there, no opportunity to buy that which will improve their lives, then what’s the point? Without a CTA you miss opportunities to sell, which is what business is all about, is it not? So when you write blog posts and emails, when you record videos and podcasts, be sure every piece has a call to action. Rather, you’re presenting the opportunity for them to walk through the door. You’ve guided them this far, now all they have to do is take that step to begin the transformation. Of course, on the other side of the door you better have a great offer, a clean cart page, good guarantees and a “thank you” email in place. Don’t leave them hanging after you make the sale! Be sure you’re nurturing those new customers with a follow-up email sequence that welcomes your new customers into the fold and makes them feel comfortable. Click here to get your free 5 C’s of Indoctrination Checklist and start converting the curious today! 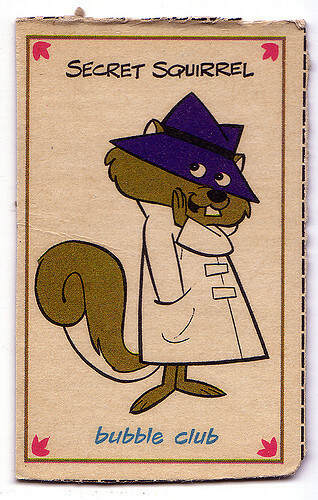 Hanna Barbara created the crime fighter Secret Squirrel in 1965. Have you ever seen that episode of the Hanna Barbara cartoon Secret Squirrel, where he takes down the Quark? The Quark was a villain who removed the bottom atom of the cornerstones of buildings, causing them to come crashing down. But anyway, I was thinking of that episode the other day, and about cornerstones. A cornerstone is an immaterial, essential element upon which something greater is built. A necessary part of the foundation of a thing. Providing healthy and natural food products at an affordable price is the cornerstone of Thrive Market. What’s the Cornerstone of Your Indoctrination Strategy? In broad terms, it’s your content marketing. This last part is what we’re concerned with here at Converting the Curious. By educating cold prospects, you indoctrinate them so they know, like and trust you enough to do business with you. How Do You Educate Cold Prospects? Using keywords in your content that answers your prospects’ questions will help you rank higher in organic search, which helps you control the narrative around the kinds of products and services you deal in. It puts you on your prospects’ radar. Many companies don’t do this, so by honing this part of your indoctrination strategy you’re already ahead of the competition. Once your prospect is drawn into your website by your first-page search ranking, well-written and researched content that not only lets them get to know you, but that backs up your authority, will quickly move them through the “know, like” part of the process. When it’s easy to read and navigate your clearly written and entertaining content, prospects are inclined to stay in your world longer. The longer they hang out, the faster they can know, like and trust you. Give yourself a little leeway to come out and mingle on your site. Write a few posts that talk about your personal experiences that led you to start your business, your opinions on current industry trends, new products you’re coming out with and why… Don’t hold yourself captive on the About page. Come out and mingle! Extend your personality and soul of your business into your lead magnet and email marketing. Make offers and use language that reflects who you are and what you stand for. Create your own tribe of weirdos or professional or whoever like-minded people you want to do business with. Creating a cornerstone out of all 5 of these things might be a little much. Consider picking one or two to focus on and sharpen at one time. With a content-based indoctrination strategy you can sell to your prospects after you’ve developed a relationship with them, not before. And that’s how you draw people in and create a tribe of raving fans. To get your own FREE 5 C’s of Indoctrination Checklist, go here. Remember Miss Cleo from TV commercials advertising free psychic readings in the late ‘90s/early 2000s? On these commercials she would give “real callers” tarot readings over the phone. She usually advised callers about their love lives with a kind of tough love approach. The callers would be shocked and delighted at her accuracy, proving Miss Cleo could indeed use the power of the tarot to show people the way. The truth is, “Miss Cleo” was a fabricated spokeswoman for the Psychic Readers Network (PRN), a pay-per-call service. Her given name was Youree Dell Harris (she passed away in 2016 from colon cancer). She was born in Los Angeles, spoke perfect English and came from a family with money. Just prior to becoming the PRN spokeswoman, she was part owner of theatre company in Seattle that produced plays she wrote. In a 2014 interview with Vice, Ms. Harris claimed the company pulled in $24 million a month for two years straight using her as a spokeswoman. The Federal Trade Commission (FTC) eventually cracked down on the Psychic Readers Network, charging the founders with deceptive advertising, billing and collection practices. The founders settled out of court for $500 million. Ms. Harris was not named in the suit. What’s Miss Cleo got to do with indoctrination? Before Miss Cleo, nobody knew about Psychic Readers Network. Only a few fringe believers called psychic hotlines. But with Miss Cleo, whose commercials were in constant rotation in the 1990s, PRN made insane amounts of money. Because “Miss Cleo” looked the part. The accent, the Afrocentric clothing, the setting of the commercials all worked together to create an air of believability. People made a connection in their minds between Miss Cleo’s appearance and supposed background and the mystical, unknown nature of tarot cards and psychic readings. They figured she must be legit. That’s the power of stereotypes and imagery. For better or worse, humans take mental shortcuts and tend to believe what we see. Cold prospects are taking the same kinds of mental shortcuts and striving to make connections when they visit your website. To indoctrinate new customers your website has to “look the part,” as it were. If there’s a disconnect between who you say you are and what prospects think you are, your sales will suffer considerably. Take a look at your website and determine if the imagery, design, copy and narrative are all in line with the essential soul of your business. Are you projecting professionalism? Whimsy? No-nonsense sophistication? Cluttered confusion? Apathy? And how can you ethically and effectively create your own “Miss Cleo” that represents who you are, what you do and what you stand for? Get your very own 5 C’s of Indoctrination checklist here.